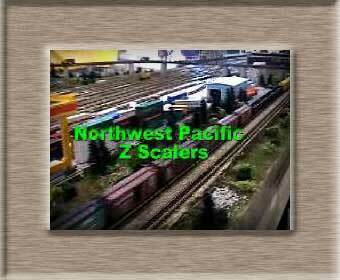 I belong to the Northwest Pacific Z Scalers (NWPZS) here in the Seattle area. I have built nine modules (see the slide shows and movie below) and help scenery others which we show from time-to-time. I also have a couple of portable Noch layouts that I take to shows when we aren't showing the modules. I installed the modules in my train room at home after the NTS 2004 show. 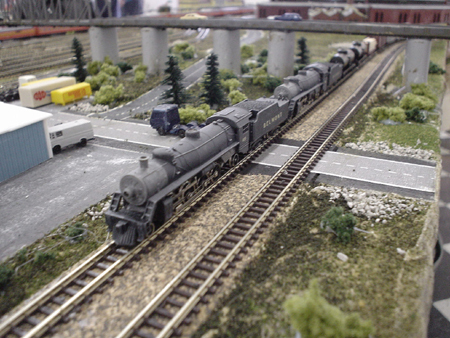 I have since sold or stored my modules and bring them out for train shows like Monroe each year. I also took the modules to the 2015 NTS in Portland, OR (see photos below). The group doesn't have scheduled meetings, but discuss things via email or one-on-one. We support the Monroe, WA show in the spring, and the Maple Valley and GTS Puyallup, WA shows in the fall. Other shows are attended by members as they come up. 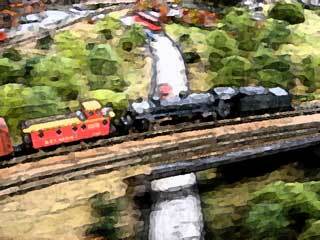 I live just south of Seattle and also do G scale in the summer time. . 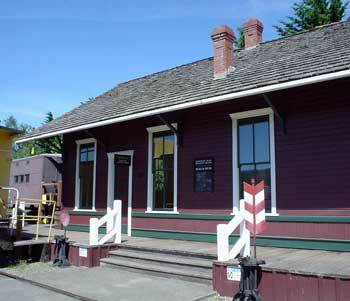 I also belong to the Puget Sound Garden Railway Society and the Boeing Employee's Model Railroad Club. If you are interested in attending with us, I have included the club contact name. These shows might change and we might add more. Contact Tom Gilchrist (tomg@tomgtomg.com) if you have suggestions or comments on the shows. Club Logo in EPS format (contact Tom). BYOZ (Bring Your Own Z) info and rules. Through the generous donations of Jim Glass, one of the founders of our club, we are offering at least 5 layout kits to be given to people getting started in Z scale. Download the info file for more info and how to be considered for one of the kits. We'll have a sample kit at upcoming shows. Video of Tom's new layout. The United Northwest Model RR Club 27th annual train show was held at the Fair Grounds again this year. We had 4 Z-Bend modules and Tom brought a new self contained layout. Steve Eichman offered to do some Z scale repairs and cleaning while showing table-top BYOZ layouts with Jerry Craig, Todd Sargeant, and Mike Scully. Jim Glass was also able to join us for a few hours with his friend Dieter. GTS (Great Train Shows) had two shows this season in Puyallup in November and January. We were at both with modules and BYOZ with folks from the Seattle and Portland area. 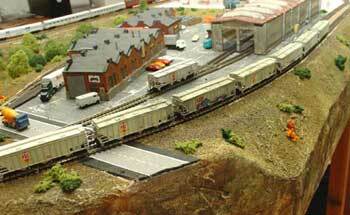 Customized Z Scale Noch Sonnenalpe layout with brass buildings and Marklin track and LED street lights. Thanks for a great show Marc (who did the show contact work), Jerry, Steve, Donny and Mike. Another great show in Monroe...we had Tom�s modules, 3 BYOZ tables, and a work table where repairs were done. The set up was the same as the last show (WGH), but a little less space. Quite a crowd Saturday AM. 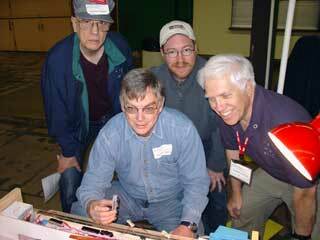 Todd and Tom ran trains on the modules, while Steve, Jerry, and Mike showed the table top modules and BYOZ layouts. Jim Glass was able to join us and talk to folks Saturday. Quite a few names were collected for the mailing lists. Thanks to all that came by and talked to us. 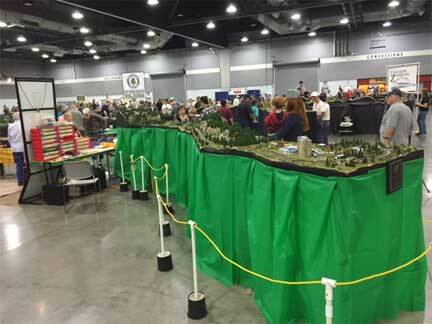 The Worlds Greatest Hobby (WGH) show only comes to the Seattle area every few years. 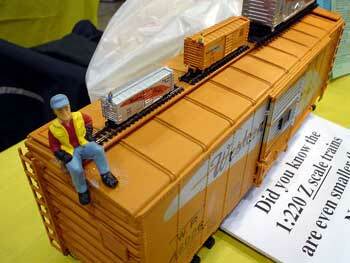 Tom and Z scaller's from the Oregon area put together a display of Z scale modules, BYOZ, and a few sale items. Brad brought a couple of his award winning modules to run with the NWPZS modules. Jerry and Steve showed table-top modules and ran trains both days. Sunday, Marc brought his T scale set which ran great all day. 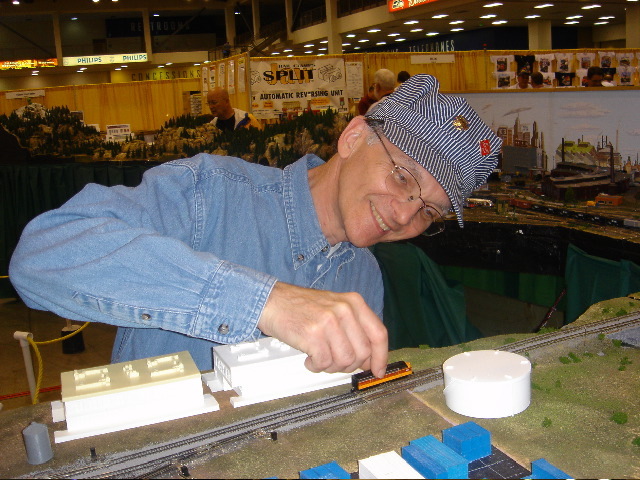 Steve also helped a few people get their Z scale engines running at our repair table. The GTS show was a two day event again this year. We had 4 BYOZ tables and no large modules. Mike, Tom and neighbor Burke ran trains both days. Marc, Donny and Steve were able to attend for the day. Jim was unable to join us...we hope to see him next show in Jan. This year, we had a couple of BYOZ tables and some modules running. Tom Gilchrist and Burke Nelson (Tom's neighbor and "train wrangler") ran the modules. Todd Sargeant showed his improved layout now using foam-core. Todd's brother-in-law, Peter Chapman joined us for the first time and worked on his layout. Mike Scully photos are here. We had a great time at the Monroe, WA show on Feb 26 and 27. We had a 20� x 30� area with most of the Z Bend modules and two 8� BYOZ tables. Jim Glass was able to join us for half a day on Saturday. Thanks to all that came by and talk to us, and to Donny, Steve, Mike, and Jerry for help with setting up, running trains, and packing up! Nov 14 & 15, 2015 Mike Scully, Donny Beck, and Jerry Craig joined us both days for BYOC. They also helped with the tear down Sunday (a record 35min). Looking forward to the Monroe show early next year. We�ll have enough space for all the modules and 3 or 4 BYOZ tables! BAZ & SoCal module photos The National Train Show (NTS) was held in Portland OR. with a super large Z scale showing. Z-Bend layouts from California (BAZ Boys, and ZoCAL), Oregon (CZM and Z Model Engineers), and Washington (NWPZS). Brad Saunders with CZM won the 1st Place Individual Module Award!Tom set up 6 modules including Jim Glass�s newly detailed 2x4 module for the NWPZS display. Unfortunately, Jim was unable to make the show this year. Feb 28 - March 1 2015 24th Anuual Model Train Show and Marketplace. Tom brought all the modules (the two club end caps and his three). Thanks to those who helped with the setup and tear down. Todd Sargeant, Mike Scully, and Jerry Craig, ran trains. 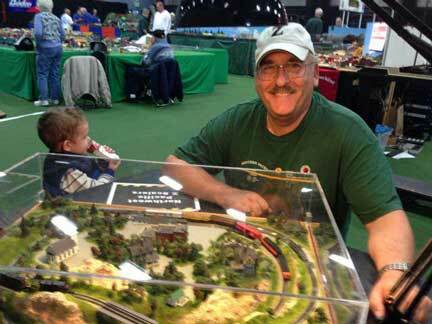 Jim Glass showed his layouts and talked to people about Z Scale. We had a 20'x16' space as a test setup for the Portland NTS this August. 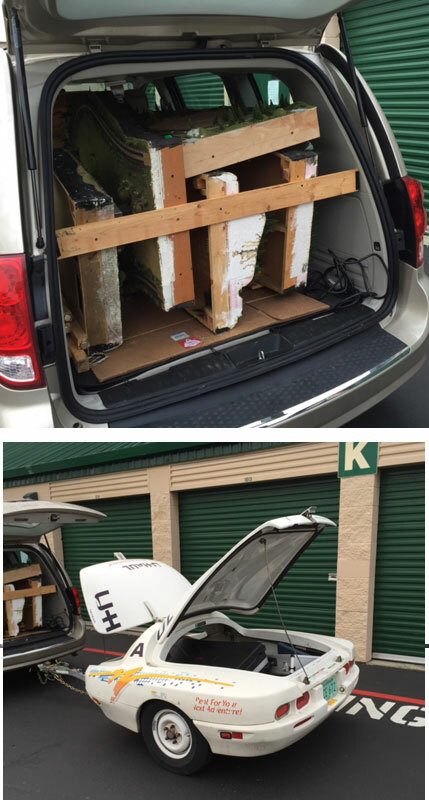 The photo shows the modules loaded in the back of the van and a small U-Haul trailer for the stanchions, and module legs. 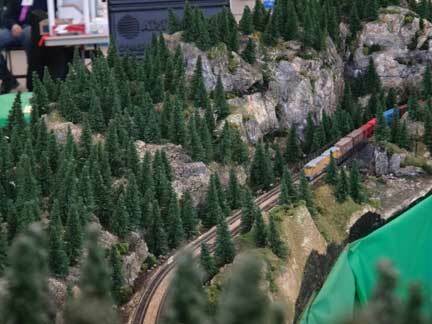 Nov 15 & 16, 2014 The Great Train Show (GTS)was held in PuyTodd Sargeantallup, WA. Tom brought three modules and ran the trains. Everyone else had layouts on the three BYOZ tables. Mike Scully, Marc Million, Jerry Craig, Donny Beck, and Jim Glass showed their layouts, talked to people about Z Scale and looked around for Z Scale deals! A fine time was had by all. Oct 18 & 19, 2014 Great show this year...no rain! 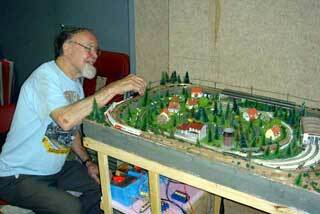 Don Scott was able to join us both days and brought three layouts...he ran 4 trains almost all the time. 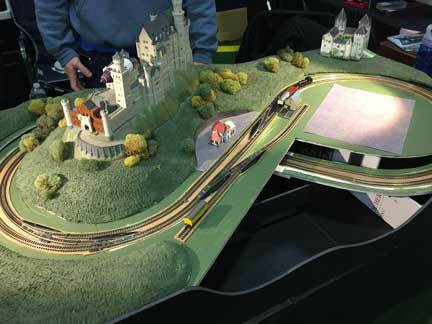 Todd Sargeant showed an improved version of his Castle layout running two Marklin steamers. 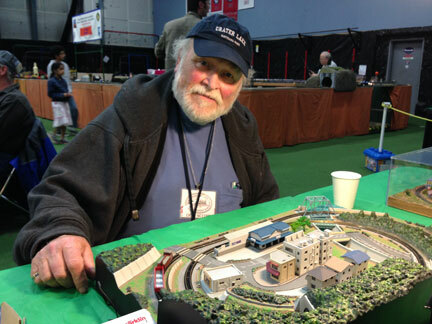 Tom Gilchrist had his Noch layout and an undecorated layout testing sectional track. Jim Glass wasn�t able to make it out this year. A good steady crowd about the same as last year. 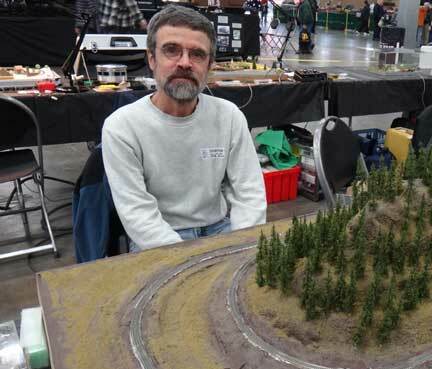 Feb 1&2, 2014 Tom Gilchrist brought three modules and his Noch Sonnenalpe layout for BYOZ. 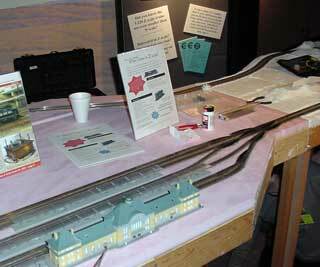 Jim Glass brought his Noch Liebenzelle layout, Marklin California Zephyrs and Santa Fe passenger set for display. 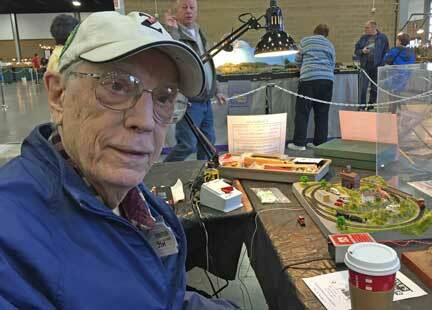 Mike Scully brought his GN AZL Mikado and assorted cars on Sunday to run on the modules. He also helped tear down. Sales apparently great for the venders and attendance was huge on Saturday...not too many on Super Bowl Sunday! 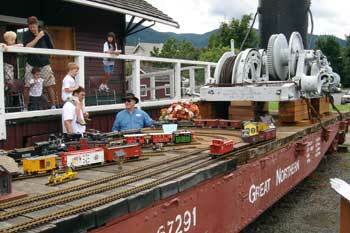 Nov 16 & 17, 2013 The Great Train Expo was held on Saturday and Sunday. Four BYOZ tables were hosted by Tom Gilchrist and Jim Glass and they were full both days. We had a number of layouts by Jerry Craig, Donny Beck, Marc Million, and Mike Scully. 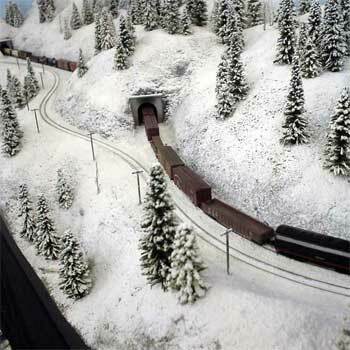 Don Scott ran a few of his European trains and we found a few more people for our mailing list. We also saw some T-Track Modules in N scale (see photos) that looked interesting for Z.
Oct 19 & 20, 2013 The 16th Annual train show is a great small show that we have been attending for many years. Tom showed two different layouts (one Saturday and the other on Sunday). 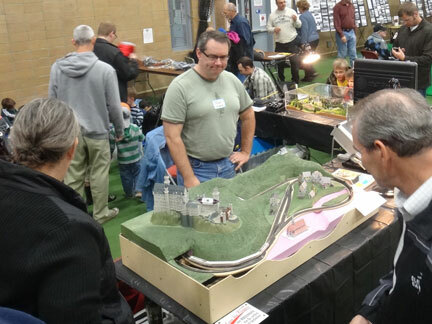 Todd Sargeant brought his re-vamped Castle layout and Don Scott shared a couple of layouts (he also spent some time with the PSGRS Live Steamers. He also took some photos which are HERE. Jim Glass and his wife came by for a while on Saturday. A good start to the 2013/14 season. Feb 2-3, 2013 We showed both BYOZ layouts and modules during the two day show. A good crowd on Saturday; not so much on Sunday. Tom brought modules and his Marklin solar set. Jim brought his module and end caps. 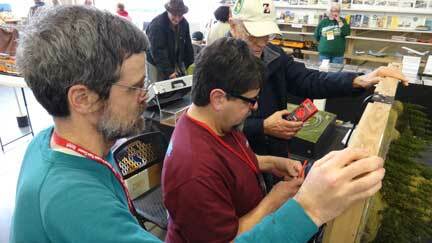 On Sunday, Don Beck, Jerry Craig, and Mike Scully helped with the BYOZ and running modules. Everyone was a big help in the teardown on Sunday! 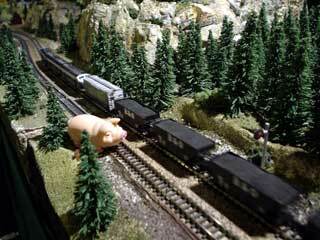 Oct 20&21, 2012 15th Annual Maple Valley Operating Model Train Show. We set up three tables and did a BYOZ display with layouts and trains from Todd Sargeant, Don Scott, and Tom Gilchrist. Feb 4-5, 2012 The Monroe show is one of our favorites. Jim Glass kept our BYOZ busy and Tom Gilchrist ran the modules. Todd Sargeant help with the setup and teardown and ran trains while at the show. 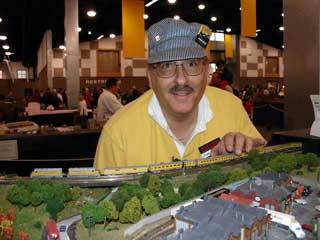 Bob Ludwig came Sunday afternoon and ran some trains. 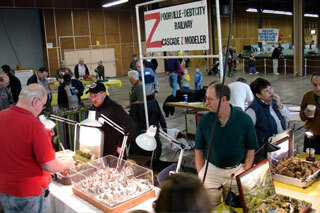 We found some new members for our mailing list and talked to a lot of folks interested in Z scale. Oct 15&16, 2011 14th Annual Maple Valley Operating Model Train Show. We set up two tables and did a BYOZ display with trains from Todd Sargeant and Tom Gilchrist. Feb 2011 Photos from the NWPSZ two modules and BYOZ table at the Feb 5&6, 2011 show. Also photos from the CZM setup at the Portland OR show later in the month. Also, "extra" photos of a wooden pull train module system and a booth on "Western Union" telegraphs operations. Tom and Jim from our club headed the show this year with both BYOZ and modules. From Oregon, Chris and Robin joined us Saturday (sorry no photos) and Mark, Jerry and Mike joined us Sunday. Andy Hunting came by with his daughter and we also saw Terry Sutfin looking around for deals. It's the first time we brought out modules in a while and we all got to run some equipment and meet new people. Combined with Chris and Robin's modules, it worked and looked great! 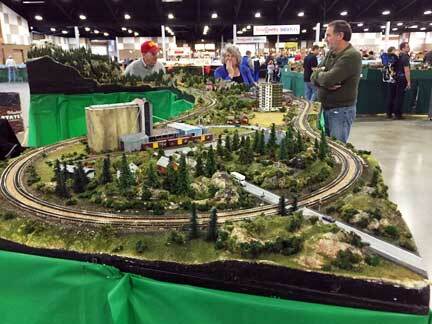 Each year the Puyallup Fair (Sept 10-26) has a Hobby House that has cases of hobbies and collectables. This year I put together a display for Z scale. No trains running, but it might be a good place to contact other Z scalers in the area. Here are photos of the display case which has a display are of about 5' square. 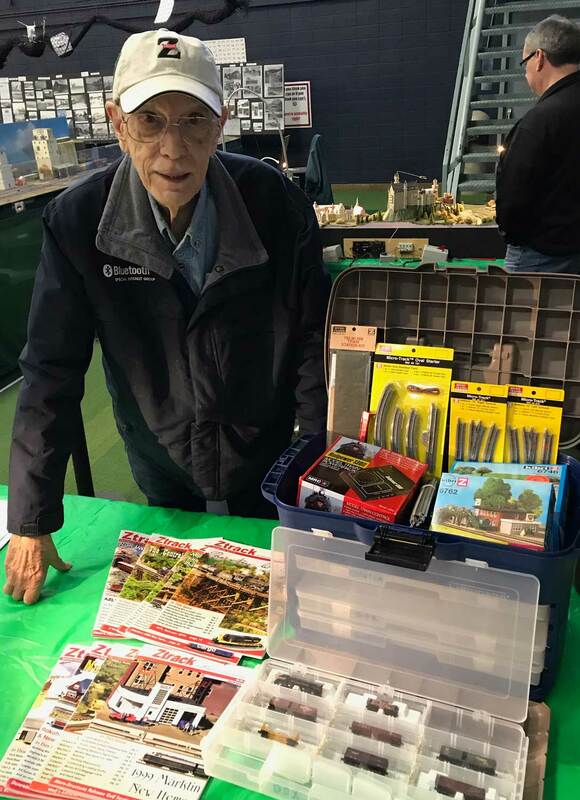 Report & Photos The NWPZS and some members of the CZM club in Oregon joined us for a two day show at the "Worlds Greatest Hobby" show at the Puyallup Fair Grounds. It was very well publizied with lots and lots of people. Jim wrote a great report and Tom tool pictures. Our 4th annual show at the depot was a little warm this year. We had a number of new displays this year. We even used the caboose to show some Z scale model trains. A great turnout and we hope everyone had a good time. Hope we see you all next year! This event is sponsored by our club (Northwest Pacific Z Scalers). A great time was had by all...great weather and lots of kids. Jim Glass was at out BYOZ table all day with lots of info. 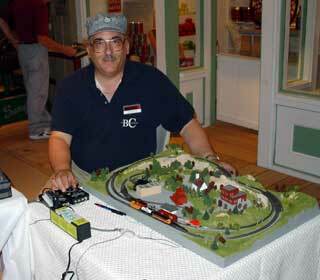 Jeff Finn brought his Battery Operated Car and ran our G Scale layout. We had a compressor and a whistle to wake up the neighbors, Our play area for th kids was a great hit again this year. This event is sponsored by our club (Northwest Pacific Z Scalers). I took the train down to the NTS and spend Saturday and part of Sunday admiring the many Z scale layouts and modules. Z scale took a number of show awards. I tried to take photos of all the modules for shape and size. 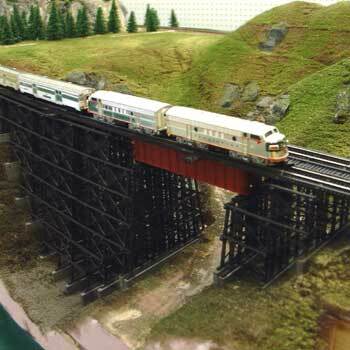 The original WP layout from the 1986 Model Railroader multi-month article was shown...work the trip. All photos by Tom Gilchrist. Here are a few photos taken by Jim Glass. We showed our BYOZ...no modules this show! Rain, Rain, Rain. Must be Fall in the Pacific Northwest. Vendors, Exhibitors and Crowds were in Puyallup fairgrounds for Trains and everything connected with Trains, from Z to Live Steam. The major Z contingent was located in the back of the large new auditorium next to the Live steamers. Terry Sutfin made lots of friends with his layouts not far from our space. Tom and Andy manned the NWPZS modules, Robin and Chris commanded another set of modules for the Klamath/Portland interests and I and Mark Million along with Robin cared for the BYOZ tables. In all a fun time for all. Crowds were good, Vendors did a healthy business with Z club members. 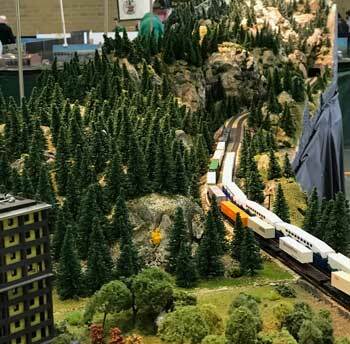 The NWPZS was well represented with Tom Gilchrist's flashing Seattle area Module setup, Harold and Thea Oakley's two Marklin European BYOZ layouts with N and Z gauge tracks and eight consists running continuously. Jim Glass, as usual, bringing up the rear with two BYOZ layouts, one under a plastic cover and unattended, the other Chris Germond and Robin Christle's BYOZ/Module. 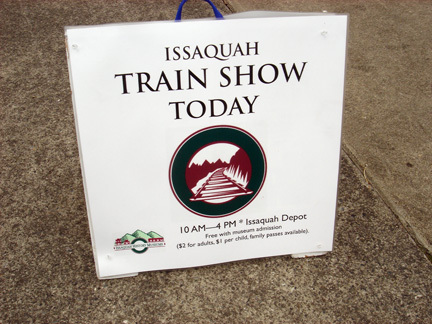 Our second annual train show to benefit the Issaquah Train Depot was a big success. Held Saturday, July 21, 2007, the show included our Z scale BYOZ, layouts, and modules as well as an HO scale layout shown by Mary McWhirter and a large "hands-on" wooden train and LEGO trains area for the kids. 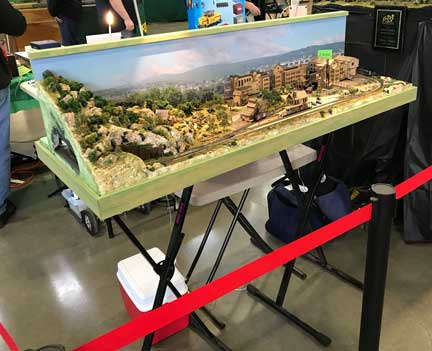 This year we were also able to have a large G Scale layout on the flatcar provided by Kristy and Sandy Webster, an air whistle for the kids provided by Chuck Cerar, a mine car display, and a "speeder" engine that ran up and down the depot tracks run by Keith Lyons. A great time and great weather this year! Slide Show Jim Glass and Tom Gilchrist or the Northwest Pacific Z Scalers traveled to Portland OR, Worlds Greatest Hobby Tour Show to display across from the Cascade Z Modelers (CZM) module layout and BYOZ tables. We showed Saturday and most of Sunday (Tom left at 1pm), Tom brought his PACAR Module and two small end caps to show folks how you could display and run modules at home. Jim brought his BYOZ layout and talked Z. We went out to eat with the CZM crew Saturday night and attended their business meeting. Members of CZM at talking about supporting the NTS in Anaheim, CA, July 2008. 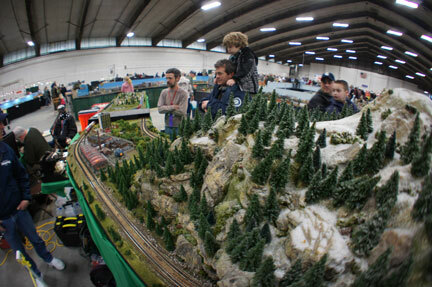 Another great show for the Northwest Pacific Z Scalers at the Puyallup Great Train Expo. The new building kept us nice and dry. The crowds were good Saturday but fell off Sunday afternoon because of the weather. Robin and Chris came up from the CZM club Saturday and brought a BYOZ and a couple of modules to add to Tom and Andy's. Robin and Jim put on clinics Saturday to help folks get started in Z scale. The Oakleys showed their Euro trains and Tom ran his UP passenger car re-paints. The Northwest Pacific Z Scalers teamed with the Issaquah Historical Society and the Puget Sound LEGO Train Club to host the first Issaquah Depot Train Show on Saturday, July 29, 2006. We hope it will be an yearly event. We had a good crowd (250+) of visitors and lots of fun. Todd Sargeant brought his new BYOZ tabletop layout. Everyone had a good time with excellent weather, good food, and a great Depot staff. Thanks to everyone...see you next year? 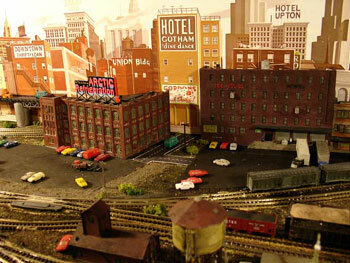 This years Monroe Train Show (April 19 & 20, 2006) was better than ever for us. We had folks from the Cascades Z Modelers (CZM) from Oregon join us with their modules. It was good to see Thea Oakley at the show after her illness...welcome back! We had two complete Z modules up and running with up to 6 trains running at once. 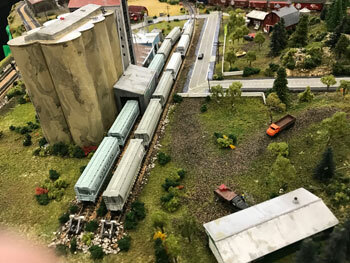 Jim Glass took care of our BYO and answered questions about Z scale. Tim Powell brought his AZL SP cab forward....we've got photos and movies. Not to be outdone, Thea and Harold Oakley brought two of their European Marklin layouts and won a well deserved 2nd place prize for layouts. 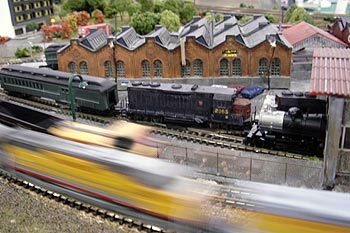 We attended the 32nd Pacific Science Center Model Railroad Show in Seattle, WA sponsored by NMRA/PNR/4th Div for three days on Jan 15-17, 2006. Jim and his wife, Andy, and Tom worked most of the three day weekend. A couple other folks brought some trains to run, but were busy in other areas of the show. Lots of kids...lots and lots of aggressive kids who couldn't quite understand why they were encourage to be "hands-on" in part of the Pacific Science Center's exhibits, but were told "please, don't touch" with the trains! Next year it's barbed-wire instead of ropes! Tom Gilchrist is featured in the photo and brought his custom painted UP passenger car set to run behind brass AZL and MT engines. Also, Jim Glass, Andy Hunting, and Bob Grant of the NPZS welcomed members of the Cascade Z Modelers (CZM) including Mark Million and Robin & Chris Christle. 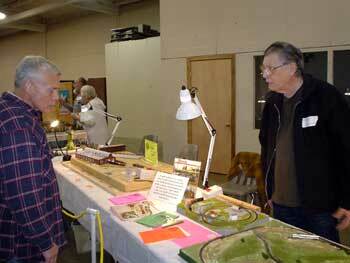 Terry Sutfin and his Poorville-Debtcity Railway were also at the show. While no CZM modules made the trip, lots of trains and a BYOZ made the trip up. 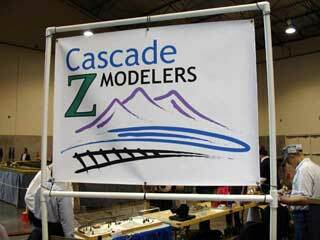 Jim Glass and Tom Gilchrist made the trip down to Vancouver, WA on Nov 12 & 13th to join the Cascade Z Modelers (CZM) for their modules and BYOZ. Tom only attended Sunday and didn't get to bring a Z-Mod module. However, Jim Glass was in attendance both days. I'll add names and captions when I get back from vacation. 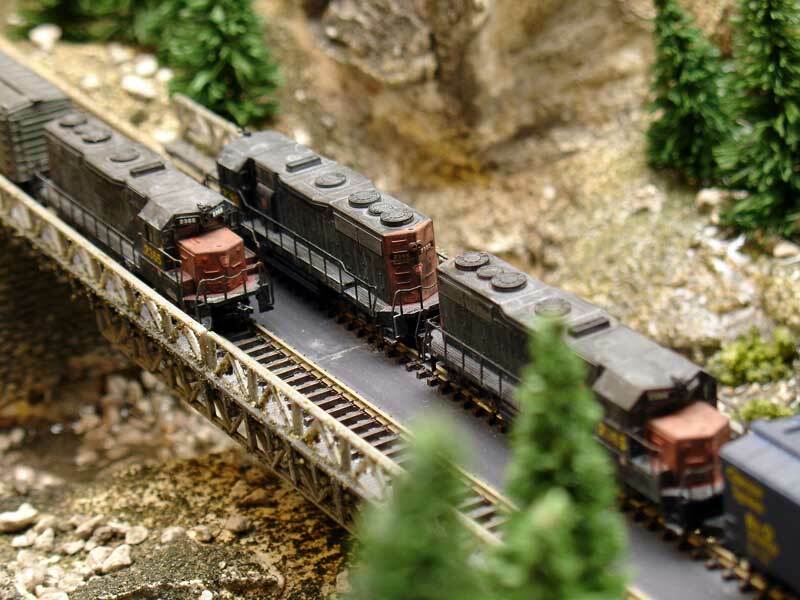 It's our annual trip to the Maple Valley Model Train Show at the Grace Hansen Community Center in Ravensdale, WA (Maple Valley). 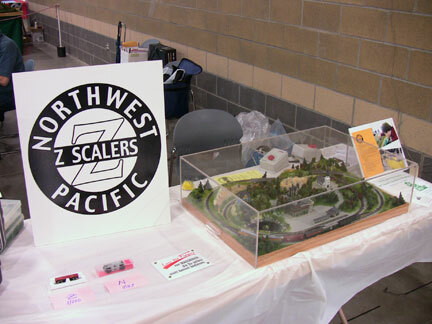 The Northwest Pacific Z Scalers had just one module at the show. Tom Gilchrist brought his "PACAR Foundry" 30 degree pocket (less than 4' long) module and two end-caps (w/non-club standard curves). This shows what you can do with a minimum of space. Other club members brought BYOZ and Andy Hunting spent Saturday operating a "repair station" to help members clean and lubricate their engines. 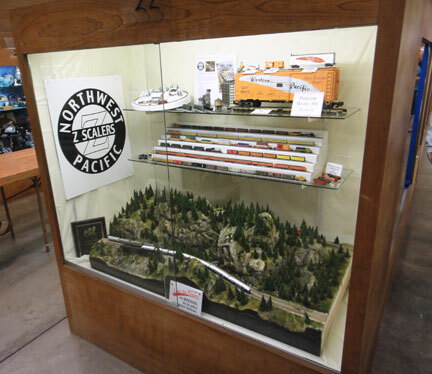 Read the show report by Andy Hunting The Northwest Pacific Z Scalers attended the annual Spring train show in Monroe, Washington this past weekend. The show is put on by a local N scale group, the United Northwest Model Railroad Club, as a charity benefit. 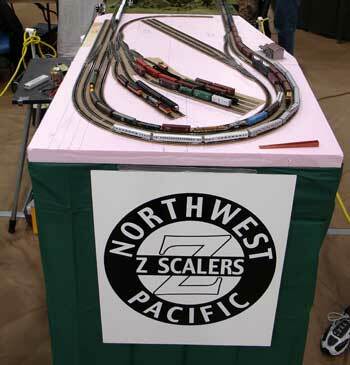 On Sunday, March 6, 2005 the Northwest Pacific Z Scalers attended the Rolling Rails show in Edmonds, WA. We had a large Z scale turnout and a new module. 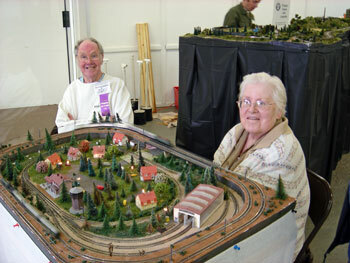 Thea and Harold Oakley showed their Euro layout. Loren Snider brought his SilverBox Z layout all the way from southern Oregon. 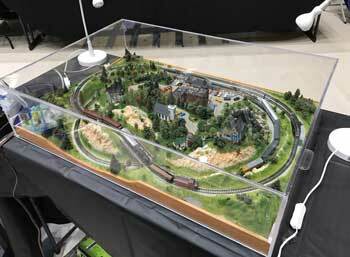 Jim Glass talked up Z scale and showed his Noch layout. Bob Grant joined us and ran some SanteFe passenger trains. Tom Gilchrist ran trains and brought his PACAR foundry module. Andy Hunting was the big news for us...he brought the newly completed yard end-cap to run for the first time. This great looking module was designed and build by Andy. 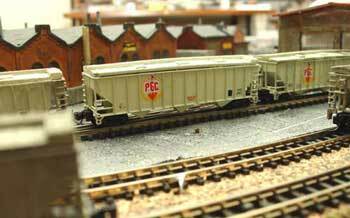 Look for this module with more scenery at the Monroe show. February, 19, 2005 Tom Gilchrist took Amtrak to Portland for the day to see the GATS show and all the Z scale layouts. 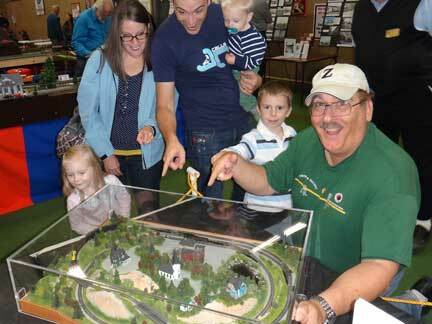 Terry Sutfin again helped bring together a great group of folks to show what they could do in Z scale. Others might have shown up on Sunday (a two day show), but I could only stay a few hours on Saturday. There are some "movies" of some of three layouts which I'll leave on-line until I need the space. Sorry, the videos are in WMV Ver 9 format for now, so they might not play on all computers. 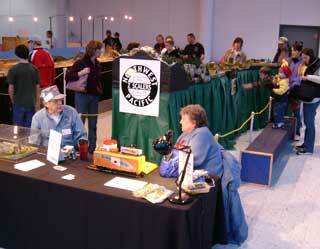 January 15-17, 2005 at the Seattle Center, the 4th Division of the NMRA held their big Seattle train show. This one used to be held over the Thanksgiving weekend, but was moved this year to January. Lots and lots of kids at this show. the NWPZS showed 5 modules and had a couple BYOZ tables with Jim Glass helping out. Andy Hunting and Tom Gilchrist ran the modules. 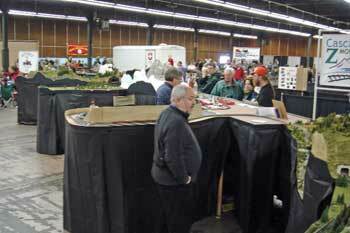 These are photos of the NWPZS BYOZ and "Pocket" (under 4') modules shown at the Maple Valley Train Show on Oct 16-17, 2004. Club members who helped out included Jim Glass, Andy Hunting, Tom Gilchrist, and Harold and Thea Oakley. The attendance was down a little because of the rain, but we all had a great time. We brought the club end-cap, two "Pocket" modules (a 10 degree curve by Andy and a 30 degree curve by Tom). Tom also brought his "Pocket" end-cap. About 12' of modules. 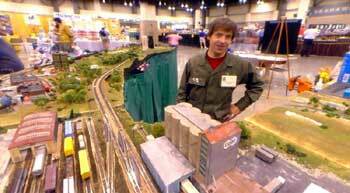 Our biggest show ever was the NMRA National Train Show July 9-11, 2004 in Seattle, WA. A major goal of the club was to have a strong Z presence at the show. We had a great time showing our modules and a number of people showed their layouts at our BYOZ (Bring Your Own Z) tables. Also shown are photos of the Z dining table by Jake Schultz, Dave George and Terry Sutfin's great Z scale layouts (in separate areas at the show), the BYOZ area, and the Z-Track booth. Our NWPZS modules won the 3rd prize in the module system category from the NMRA thanks to the hard work of Andy Hunting, Tom Gilchrist, Jim Glass, and John Barrett (In the single shot). One sad note...this was the last show and NWPZS event for John Barrett as he is retiring from Boeing and leaving the area. Here are two QuickTime VR movies. They allow you to view a 360 degree shot. 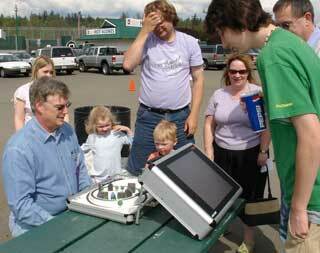 The first was taken at the NTS 2004 with the camera on the "InterBay" module. Andy Hunting and Tom Gilchrist are looking at the camera. The second QTVR was taken after the NTS 2004 on July 23, 2004 and shows Tom's modules at home in his train room. To make them fit, two 90 degree modules were built. The curves on the 90's are too tight for our display standards, so they have never been to a show. I also built two end-caps that provide a loop. QTVR photo instructions...Once the photo is downloaded, you press your left mouse button and pan the scene. You can use the "shift" and "control" keys to zoom. (You need the QTVR Player to view these photo). Monroe, WA. April 2004 Slide Show Our 2004 trip to Monroe, WA on April 24 & 25 was a lot of fun. We met lots of new and old friends. Our system included a new module by Andy Hunting with a big timber bridge. While the module is not complete yet, it will be a great addition to the modules at the NTS in July. I didn't have time to take lots of close-ups, so most are of the modules. I did take some video and will try to put something together for the WEB in the next few weeks. My Golden Empire at Monroe, WA April 2004 Slide Show Lyn St.Laurent's "My Golden Empire" Z scale layout was shown at the Monroe show. 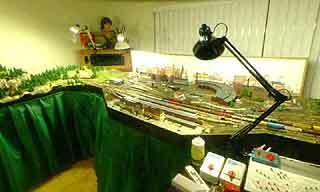 While Lyn wanted to show this layout at the NTS, he is needing room in his new home and is selling the complete layout. The Monroe show will likely be the only public showing (unless the new owner is willing to show it). There were lots of people around the layout both days admiring the layout. The pictures are of Lyn, his wife, and Jim Glass of our club. GATS in Seattle, WA. Slide Show March 2004 Another GATS show...this time in Seattle, WA on March 13-14, 2004. We brought modules that needed work and new ones. Andy Hunting has attached his "Z-Bench" with hand laid track and switches he uses to repair engines and rolling stock during the show. Tom Gilchrist started to scenery his 30 degree module with a factory made of castings. 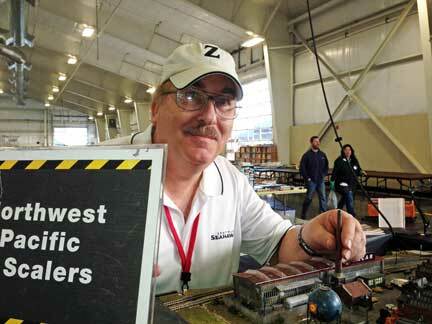 Jim Glass was our Z-Ambassador making lots of contacts and helping spread the word about Z Scale. Z Scale Slide Show at GATS in Portland, OR Feb 2004 The GATS show in Portland, OR was held on Feb 14-15, 2004. 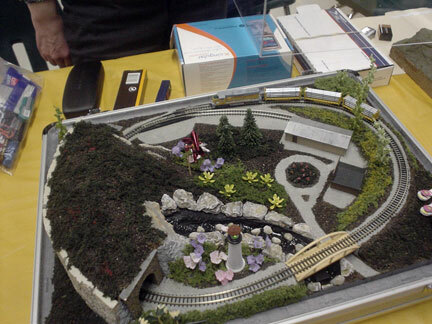 A number of Z scalers showed their layouts. The NWPZS brought our two module end-caps to generate some interest in modules. Tom Gilchrist and Jim Glass made the trip and also showed some small layouts. Z Scale Slide Show (BYOZ & Modules) Nov 2003 GATS show in Puyallup, WA, Nov 23-24, 2003. (Club modules and Z Layouts). New 30degree and 4' module for this show. Pictures show before and after scenery painting. I brought the modules with track with plaster and rocks in place. Did painting and trees during show. 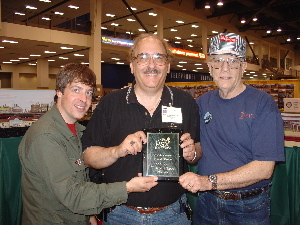 Show participation was led by Jim Glass. Also pictures from Pacific Science Center Show (Nov 28-30, 2003) led by Andy Hunting with help from John, Jim, and Tom. Andy brought just the 5 modules (no yards or towns) for the limited space at the show. 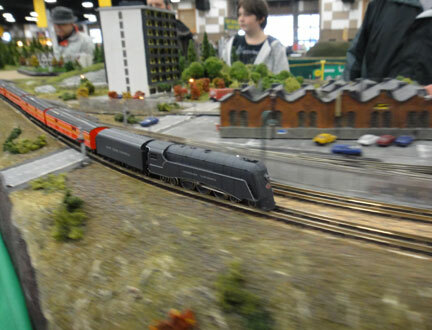 We have had three shows where we did not take our Z scale modules. We have been trying a "Bring your own Z" layout (BYOZ) concept. 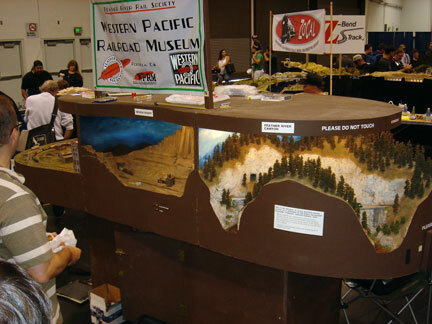 A number of members of the Northwest Pacific Z Scalers displayed portable layouts (2' x 4' or smaller) at both the train show in Auburn, WA at a local museum in Sept. 2003 and in Maple Valley, WA in Oct 2003. 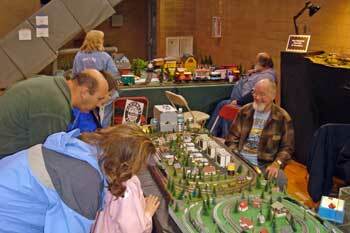 Also included is the table at the Boeing Swap Meet in November where we showed a couple of Z Scale layouts in the entryway...very popular. These are slides of the people and layouts displayed. 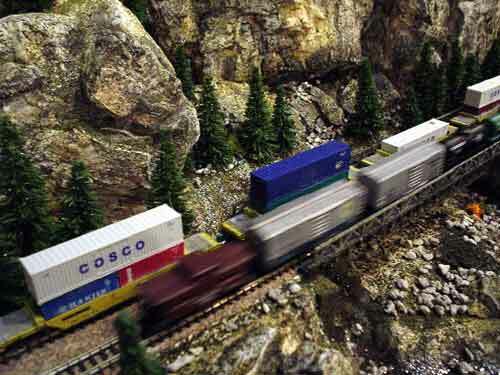 This is an 8 minute movie of the modules shown at the Monroe, WA train show in April, 2003. 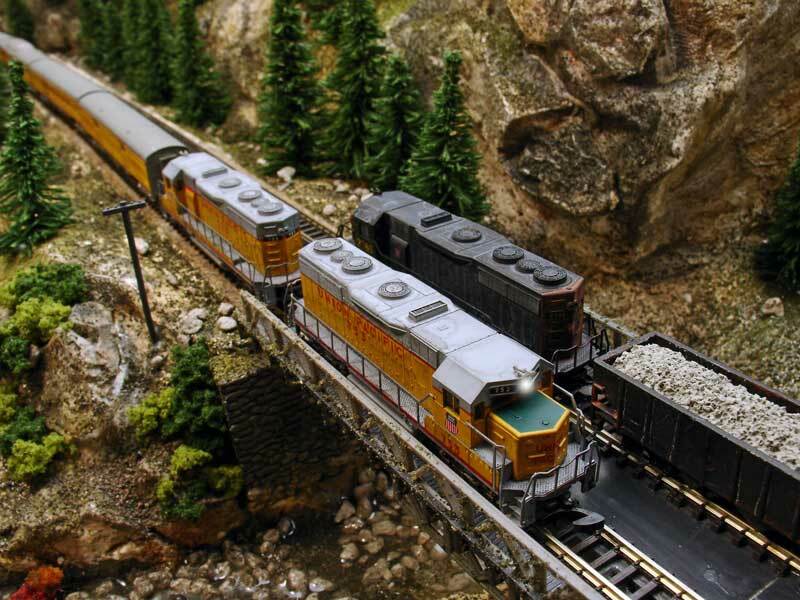 The modules are owned by members of the Northwest Pacific Z Scalers model railroad club here in Seattle. This movie will stream using QuickTime and is about 20mb in size. It was produced on a Mac using iMovie. A DVD is available for a $10 contribution to the club. Run the slide show for further information. 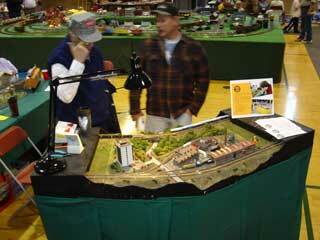 These are photos from the Monroe, WA train show in April 2003 where I showed some of my Z Scale modules. The new MT GP-35s are great looking and run smoothly. However, out of the box, they are too clean for my layout, so I have done some weathering. The weathering also brings out all the casting details of these great looking units. On the PRR units I used an off-white acrylic (water based) paint diluted in lots of water to make a "wash". I kept adding coats and fast-drying using a hair dyer until I got the effect I wanted. I also added weathered "noses" the same way using red primer which kinda makes them look like SPs. I added a few drops of India Ink in an alcohol wash for the final touch. The UP's got only a light India ink wash on the body with extra coats on the stairs, walkways, and exhausts. The photos were taken on my Snoqualmie Falls module...a favorite photo shot location. The UPs are heading up my UP custom painted passenger set. The "greys" are a little darker on my passenger cars because I matched the color with the grey of the AZL engines I used to have. I think the black weathering on the GPs makes the difference less noticeable. Click on photos to get a 800x600 shot. Miller Engineering has a number of animated signs for HO. Some of their signs also come in a slightly smaller size for N scale. 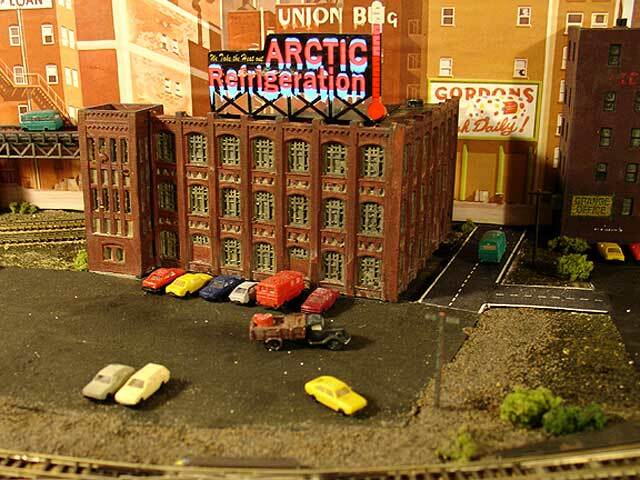 I bought the "Arctic" sign for my industrial section of my Z scale King Street Station module. 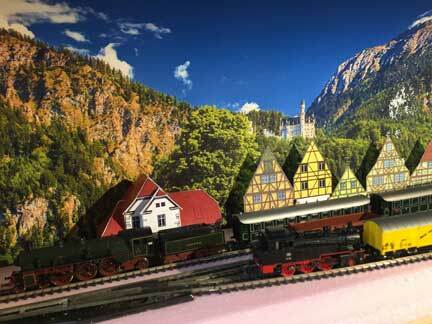 The building I mounted it on has only two walls (castings from a Kibri Factory kit) and is open on the left side to hide the double track main line that disappears into a backdrop to a mountain scene on the other side. I mounted the electronic controller inside the building. The power supply is mounted on the bottom of the module. I also bought an experimenter's kit to try my had at making my own sign for my PACCAR foundry. I was originally going to mount it on the Nansen Street Models building front on the right, but it is a solid casting and I didn't want to mess up my paint job. Click the photos for a slightly larger view. 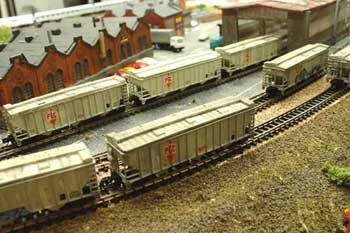 I needed some covered hopper cars for the upcoming show in Monroe, WA for a kit-bashed a grain elevator out of Z and N scale kits on one of my modules. The cars started as Pennzee SP1003 coal cars. The cover was first built of a couple of flat sheets of ribbed plastic sheets. The catwalk was made of plastic with a square ribbed pattern. The hatches are just six squares of plane sheet plastic. Once I built the pattern, I made a mold and cast the seven covers for the coal cars. Once glued on, I first airbrushed primer, then added two coats of antique white. On one car I used putty to seal the seam between the car and the cover. I decided it was too much work, and left the others with a gap between the cover and the car sides...it isn't that noticeable. The decals are from an N scale set by Microscale (60-4291) for the Producers Grain Corporation. Once the decals were dry, I applied a dull finish. I like to weather my cars, so I used black ink in alcohol to apply the weathering look to all the cars but one. I even put some graffiti on a couple of the cars. I tried to covert one Marklin coal car, but I don't think it looks as good because it is shorter and not as tall. These photos show the seven cars next to my "PACCAR" (Pacific Car and Foundry) industry. The buildings are bashed from Kibri and Marklin. 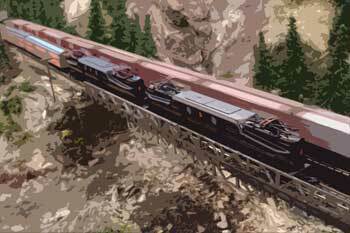 A fast freight overtakes a stack train at Snoqualmie Pass in the Washington Cascades...one of the NWPZS modules. Tom's Z Scale ver 02/17/2019 Tom Gilchrist, For updates, suggestions, and corrections, please contact Tom. The opinions and views expressed are my own and might not reflect the views of my employers or the NWPZS club.